John Pollock is joined by Keep It 2000’s Nate Milton to review the final episode of WWE SmackDownbefore the Money in the Bank event. 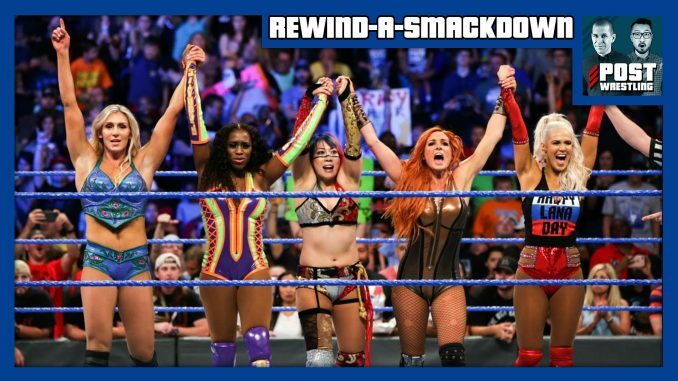 On this show, we saw the BIGGEST WOMEN’S TAG IN SMACKDOWN HISTORY, a cameo appearance from Jerry Lawler in Memphis, Daniel Bryan took on Shelton Benjamin in an entertaining match, Shinsuke Nakamura vs. Jeff Hardy, a match with Samoa Joe vs. Rusev with The Miz as the special referee. We also previewed the entire Money in the Bank card with our picks for the two ladder match winners, and discussed Jeff Hardy’s arrest from this past March and guilty plea on Monday, as well as Sinclair Broadcast Group CEO Chris Ripley announcing that Ring of Honor would run a card from Madison Square Garden in 2019.